Since 2007, the Jelly Belly Candy Company has been producing a line of jelly beans with a maniacal purpose. 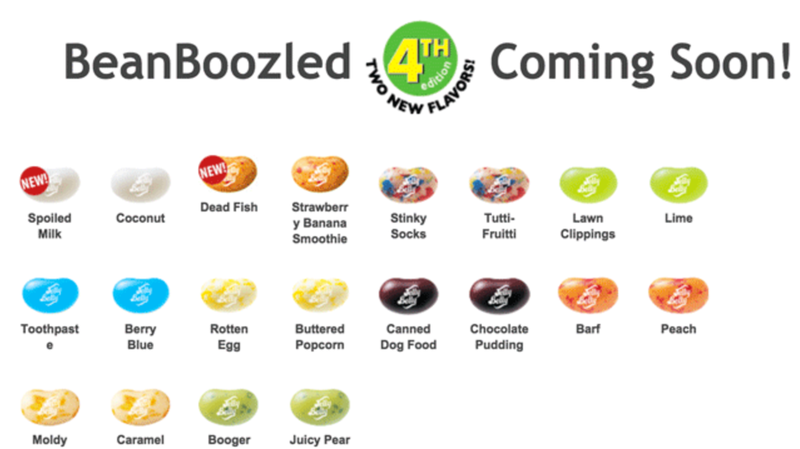 Each BeanBoozled collection includes over-the-top, gross-out flavors like Barf, Stinky Socks, and Rotten Egg. Their fourth edition is slated to hit candy stores this spring and it will feature two nasty new varieties: Dead Fish and Spoiled Milk. The most evil aspect of the BeanBoozled series is that it also includes beans from Jelly Belly’s classic line of flavors, with each gag-inducing candy having an identical-looking, sweet-tasting counterpart. Canned Dog Food is indistinguishable from Chocolate Pudding, and Booger has the same mottled green hue as Juicy Pear. Spoiled Milk and Dead Fish will come with the deceptive doppelgängers Coconut and Strawberry Banana Smoothie, respectively. Following the release of the line’s third edition in 2013, the candy became something of an Internet phenomenon. According to Jelly Belly, over one million “BeanBoozled” challenge videos have been uploaded to YouTube depicting brave souls torturing themselves through a box of the beans for the sake of our entertainment. If you value your taste buds, this may the smarter way to experience the challenge.